“Martyrs & Monsters” is an eclectic collection boasting a variety of stories sure to satisfy lovers of both horror and literary fiction. These stories run the gamut, from bleak Noir tales, straightforward horror, intriguing takes on the origins of vampires and zombies, even science fiction and a bit of dark fantasy, also. Regardless of the form, Dunbar is a literary craftsman, a stylist, skilled at drawing meaningful characters, building suspense, and painting vivid, striking prose. And of course, it wouldn't be a Dunbar collection without a rendering of the Jersey Devil myth. Two of the strongest tales in this collection are “Gray Soil” and “Red Soil”, for their different takes on the birth of zombies and vampires – especially the implication in “Red Soil” that they share a common, ancestral line. Also, because of Dunbar's consistent literary voice, both tales read like the classic Stoker narrative, rather than just “more zombie and vampire stories”. “Getting Wet” and “Are We Dead Yet” garner high marks as well, rendering a bit of “Urban Gothic Noir” flavor – if you will – and especially grabbing is the surprise ending of “Getting Wet”. In “The Folly”, Dunbar once again takes readers into the twisted labyrinth of the Jersey Devil myth, but it's a fresh telling, not a rehashing of his novels “The Pines” and “The Shore.” Also entertaining is the tale's Southern Gothic flavor, evoking thoughts of Flannery O'Connor and Tom Piccirilli's “A Choir of Ill Children”. “High Rise” invokes the tale of the succubus, also with another unexpected, sacrificial ending. Perhaps the collection's strongest is “Like a Story”, simply because it proves Dunbar is more than just a detached stylist, he's a storyteller at heart. Invoking the classic “Stephen King boy's tale” with its authentic voice, “Like a Story” enters the world of two displaced orphans trying desperately to find a place in a world that doesn't want them. There's also an air of terrible discovery and loss of innocence, on par with one of the best Joe Hill shorts, “Van Helsing's Boys” (from “20th Century Ghosts”). Short story collections are always a mixed bag, but in this case the “mixed” refers to variety, not quality. 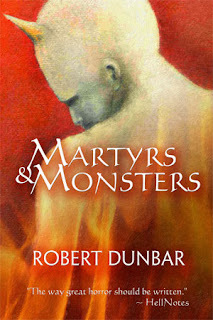 For something different and substantial in short dark fiction, “Martyrs & Monsters” is an excellent choice. Visit www.dunbarauthor.com, www.myspace.com/dunbarrobert, and www.darkhart.com. Buy it today.